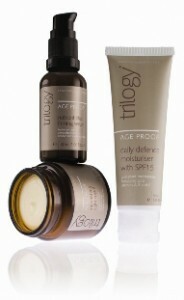 Leading New Zealand organic beauty brand, Trilogy, has just released their AGE PROOF skin care range. The Trilogy team have created a three product combo to combat the signs of aging and follow the simple philosophy of protect, revive and nourish. To protect the skin Trilogy have created the Daily Defence Moisturiser with SPF15. This a light, non-whitening cream containing pure plant oils that absorb readily. The SPF15 formulation reflects and disperses UV rays to protect the skin from the suns harsh rays. Make no mistake this is a daily moisturiser, not a sun cream and it will hydrate and soften the skin beautifully. To revive the skin the rose hip experts deliver us their Nutrient Plus Firming Serum. This product is packed with a ton of natural active ingredients that will lift and restore tired, aging skin. Serums are an excellent way to make your face look instantly more vibrant and the Trilogy is one is one your complexion is likely to love. Green Tea, Licorice and Mulberry extracts are natural skin brighteners and Hyaluronic Acid to plump up the skin. The final product in the AGE PROOF trio is the Replenishing Night Cream. This is the deep nourisher of the three, regenerating the skin's elasticity and suppleness whilst smoothing out those fine lines. The essential fatty acids (Omega 3 and 6) contained in the avocado, rosehip and marula oils found in this product helps the skin to repair and renew itself.